Hinged full-page letter guide fits standard letter-size paper. Hinge holds your paper in place. Sign a receipt or any other items independently. 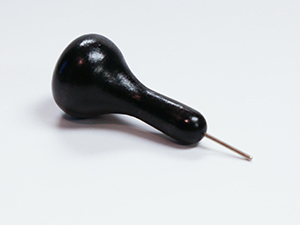 This signature guides is made from durable plastic, lightweight and easy to carry in your purse or pocket. The full page letter guide fits standard 8-1/2 by 11 inch paper. 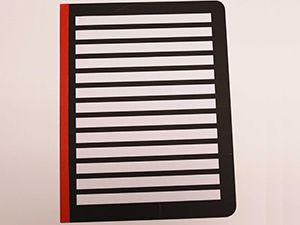 It will holds your paper in place and provides guides for writing in straight lines. Ideal for notes, shopping lists and other common writing tasks. 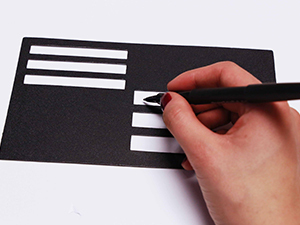 Thin, durable plastic writing guide that fits standard size checks. Offers guides to fill in your check independently and conveniently fits in your checkbook. This coil tablet has 70 single-sided pages of bold lined paper. The paper is standard 8-1/2 by 11 inches with lines set 3/4 inch apart so you can easily write with a 20/20 pen. The cover is white for easy personalization. Ideal for low vision users. 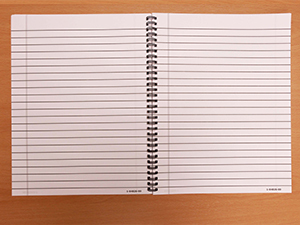 100 sheets of single-sided pages of bold lined paper. The paper is standard 8-1/2 by 11 inches with lines set 3/4 inch apart so you can easily write with a 20/20 pen. 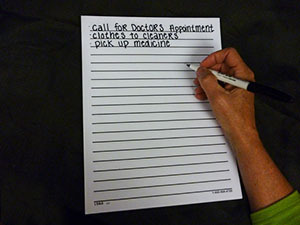 Great for shopping lists, phone messages or any other writing task. 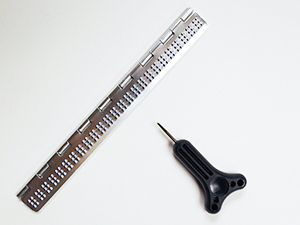 This standard, wood handled braille stylus is a great tool for creating braille writing. This slate is great for labeling all types of products. Use 1/2′ dymo tape to label DVDs, CDs, file folders and much more.